The Cheddar Man is the oldest complete human skeleton found in Britain. He died a violent death around 7150 BC in Gough’s Cave in Chedder Gorge, Somerset, where his remains were uncovered in 1903. Cheddar Man made headlines when the latest forensic reconstruction from London’s Natural History Museum depicted him as dark skinned, a surprising revelation some criticised as politically motivated. Cheddar Man was not the first Briton: human fossils have been found in Gough’s cave predating Cheddar Man by 5,000 years. However these early inhabitants did not survive the ice age, and bear no relation to either Cheddar Man or modern Britons. He was young, most likely in his mid 20s. Cheddar Man belonged to mitochondrial haplogroup U5 (from the female line), a genome found mainly in Finns and Laplanders today. According to the latest genome sequencing Cheddar Man had blue eyes, ‘dark to black’ skin and curly, black hair. Cheddar Man belonged to a wave of ‘Mesolithic’ (Middle Stone Age) settlers, blue eyed hunters-gatherers who crossed to Britain by land as the ice sheets retreated. Typical of hunter-gatherers, their numbers were small; probably only 12,000 in Cheddar Man’s time. They are not the main ancestors of modern Britain. In the Neolithic Era (New Stone Age), lighter skinned, brown eyed farmers of Middle Eastern origin settled across Europe, introducing livestock herding, grains and a milk based diet. They interbred with, and ultimately replaced, the smaller indigenous population. In Britain they constructed Stonehenge and Skara Brae. Neolithic farmer ancestry is strongest in Sardinians today. A third wave settled in Britain during the mid-Bronze Age, 5,000 years after Cheddar Man’s time. The demographic transformation is evidenced by the spread of Bell Breaker pottery around the time and the replacement of stone monoliths with humbler burial mounds. The ‘Bell Beakers’ were part of a larger migration of Indo-European speakers across Europe and South Asia. They introduced horses, bronze weaponry and the Y chromosomal haplogroup R1-B, which was not present in Western Europeans before but dominates today. More numerous, they engulfed the earlier populations and left a stronger genetic imprint. They were the progenitors of the ancient Celts. Further, better known migrations of the Anglo Saxons and Norse followed in the Middle Ages. Disproportionate to their cultural influence, the Roman and Norman invasions had little impact on Britain’s genetic makeup. In a recent article published by the ‘New Scientist’, published on the 21st February 2018, geneticist Susan Walsh, who worked on Cheddar Man project, admitted the data on Cheddar Man’s skin colour is not conclusive. The article further stipulates that recent genetic research on indigenous populations in Southern Africa by Brenna Henn of Stony Brook University demonstrated substantial variations in skin colour among individuals with similar genotypes. Like the colour of dinosaurs, discerning Cheddar Man’s complexion is educated guesswork. Despite this, scientists have speculated Mesolithic Europeans were dark skinned for some time. The genes for blue eyes evolved before the genes which determine light skin and blond hair. 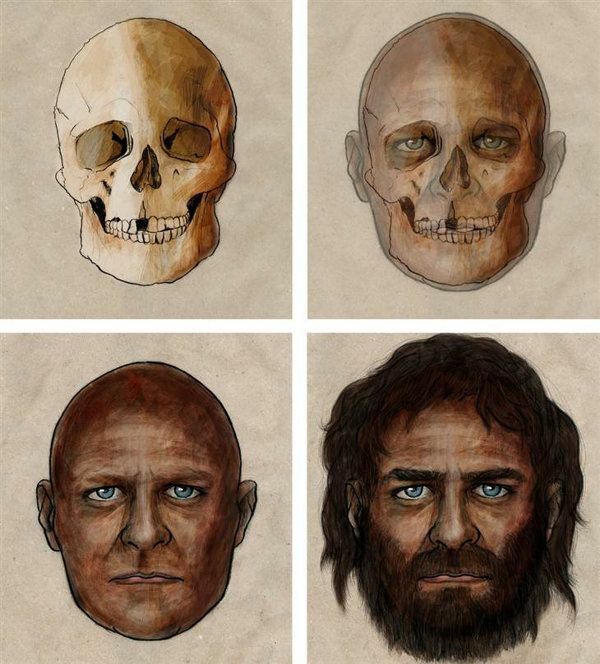 The Spanish LaBrana man (pictured right), a contemporary of Cheddar Man, exhibited similar traits. Britain’s Mesolithic population, of which Cheddar Man belonged, were healthy and ate mainly fish, which is rich in vitamin D. Europeans evolved light skin to extract more vitamin D from the sun, so when excessive sunlight or a high seafood diet makes it abundant, these genes do not develop. This is why the Inuit maintain dark skin despite living in the boreal extremes of North America. Originating from Anatolia and the steppes of southern Russia respectively, and eating milk products and bread over seafood, the Neolithic farmers and Bell Beaker people were lighter skinned than Cheddar Man’s ilk. It is normal for dark skinned people to develop lighter skin after millennia in cold European climates too, as did Ashkenazi Jews. Today 10% of British DNA traces back to the Mesolithic hunter-gatherers like Cheddar Man, roughly 10% from Neolithic farmers and the rest, perhaps even up to 90%, from the Bell Beakers and later immigrants. Genetics is a dynamic discipline. New technology, discoveries and research is constantly introducing new evidence and debunking the old. Yes, media coverage of the Cheddar Man was sensationalist, but that is their nature. It is important to remember these migrations occurred over centuries, with interbreeding always occurring. What information we can discern from a handful of fossilised cavemen remains a murky glimpse to a long lost past. Note: Studies on prehistoric migrations and genomes is convoluted but fascinating. I’ve linked some resources for further reading. The Eupedia and Nature posts are particularly detailed. This entry was posted in science and tagged Britain, cheddar man, DNA, europe, genetics, haplogroups, hunter gatherers, indo-europeans, mesolithic, migrations, prehistory by Para. Bookmark the permalink.